With smartphones such as the iPhone, and mobile devices like the iPad becoming more and more expensive, it stands to reason that consumers will want to look after their gadgets as much as humanely possible. We can all take the standard precautions such as covering our devices with protective cases, in the hope that it prevents any knocks or scratches, having device insurance so that if it does get lost or stolen; at least we know we can get some financial compensation for it. But, is that enough? What if your iPhone is snatched? If you are anything like me, then you will want to know just exactly who the perpetrator is, in the hope that you can hand in some sort of information over to the relevant authorities. If your device is jailbroken, a tweak on Cydia known as iCaughtU Pro makes that task just a little bit easier. iCaughtU Pro is essentially a security-based tweak that springs into action when the passcode is entered incorrectly onto the device a preset number of times. Whoever is using the device at the time will have no idea the tweak is running, and when the failed attempt trigger is breached; the tweak uses the front facing camera of the iPhone in question to snap a few pictures of the intruder and discreetly sends it via email to an address specified through the settings panel. The tweak also comes with additional functionality, such as the ability to send out a text message to a designated number when the passcode is entered incorrectly, as well as granting access to the device but limiting the usage options, which is particularly useful in allowing the phone to obtain a GPS fix. iCaughtU Pro is in no way a perfect security solution and obviously won’t prevent the phone from being taken away from you. However, if it is running alongside a passcode, there is a good chance that it could provide some vital visual images of the naughty individual in question. 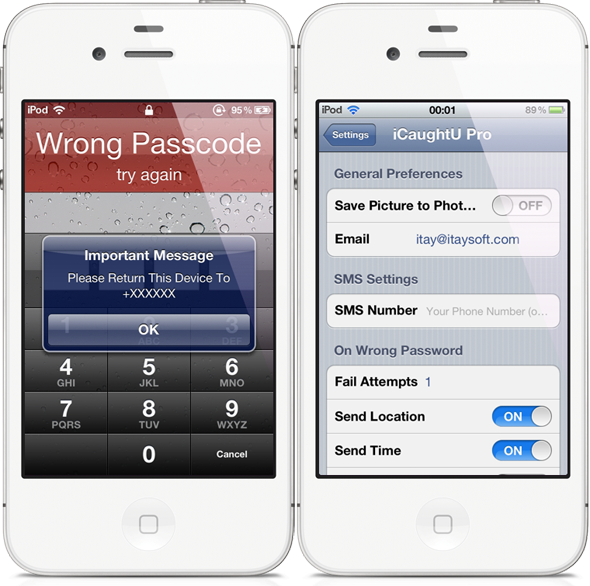 The iCaughtU Pro package is available from the BigBoss repository at a cost of $2.50, and requires a device with a forward-facing camera running on iOS 4.0 and above.